Tonight’s ride was not on the schedule and more about the core group of riders who always show than some great destination or adventure. Amber suggested we stop by and see her friend’s new place on Murland then make our way up to the Stone House and Dutch Girl Doughnuts? Okay by me and the group’s voice became one we were off. Second left and on over to LaSalle gardens, up LaSalle Boulevard then out to Linwood and across the lodge. We found this beautiful house in the University district as it is locally known and we all took a moment of breath and let Amber and James check-er out and snap a few pictures. From there we made our way once again through beautiful Palmer Park then out to Woodward and onto the Stone House. We saddled back up and crossed over Woodward at 7 mile as Dan lead us into and on through the inner park. Please go here if you have never been. The trees and the sounds of nature at night in Palmer Park are simply incredible! Dan charted us through and out onto Third Ave where the Tri-Athletes Jen and Julia made their break and within a few minutes two of the hottest chicks were nowhere to be seen! Of course when the group made it back to MCB the ladies were ‘Carbing-up’ as all I could do was smile and thank the heavens for sending me such a lady in Jen. Tonight’s ride was more about rolling and exercise than History or Nature for that matter. Tonight’s goal was to make it to the Speed Boat In down in Ecorse. It is kind of a funny little place known for its Friday Night Fish fry but what I like most about it is the old wooden cigarette boat sticking 1/2 out of the roof. Interesting sight. Big Mike and his Blonde beauty Lisa made it down tonight and we decided to head across the pedestrian bridge and into Mexican town as a way to begin the ride. When we made it to Clark Park instead of taking the short way round I ditched to the North and rode into the Historic Park that I never really had been into before. The old buildings and architecture harkens back to the time of Detroit’s greatness from the early to the late 1920’s. We all stopped at the cool Clark Park Sign as Amber made the “photo call” and we all responded like condition Pavlovian Dogs. On the way over to the sign big Mike, with all of the torque his old Hockey legs can still generate, snapped one of his peddles off his bike. Yep it came off and Mike was sunk and out of the game. Try as we might we could not make it work and Mike and Lisa headed back to MCB while the rest of us made a mad dash down river. Chris Frey was running late but somehow found us down on Jefferson as Dave’s flat tire gave him a good chance to catch up. As we all became as one group and mounted up and made our way back out onto Jefferson and took off for the last mile down to the Speed Boat Inn. In all of the excitement no one noticed that Chris was not with us? He got a flat too! Just after we had our first round of refreshments out on the patio Chris came rolling up and as soon as he walked in, somebody handed that man a Beer! Our stay at the Speed Boat was brief, as we soon found ourselves back up in the saddles and on our way to Donavan’s just outside of Mexican town kind of situated between the old rail road station and the new pedestrian bridge overpass on 96. Shannon was there to greet us and with a few cheers we said our goodbyes and made it back to MCB without incident. It has been awhile since my last Blog entry so I will do my best to give you an idea about the fun we had this evening even though it was a month ago this ride took place. Gary Turla joined us tonight as all of the typical Beautiful ladies that come with us where nowhere to be found as this was going to be one heck of a ride. Tonight’s ride was 35 miles plus and was scheduled to take people along a partial section of the Emerald Necklace route that runs in concert with the Rouge river on the cities far west side. Gary was apprehensive at first learning how far the ride was scheduled for but we convinced him to come anyways. Off we went on Canfield heading west to Grand river where we would make the turn right and head up to old Redford where the trail begins. Traveling smack into a strong westerly breeze after about 6-7 miles Gary stopped and said he was going to turn around? We stopped too and told him, “then we are all going with you as the group never breaks up”. Chris Frey was most supportive and what was decided next is that Gary would lead the group so we would all be traveling at his pace. Slicing through Rosedale Park North we charted our way over to Margareta making our way across Lahser we found ourselves back on the Emerald Trail. Just behind Billy Rogell golf course you will find some amazing home’s, virgin watershed topography dotted with Virgin Oaks, ahhhhh the way it is supposed to be. The group was surprised by the beauty and the up and downs of the winding road. Crossing Grand River then 6 mile on Beaverton we snaked with the river until we found ourselves at the now closed corner of Riverdale and Dehner. The abandoned park returning back to nature Dan pulled out some fresh Brews he brought with him on his bike and we all enjoyed the fresh suds as we tried to catch up with our breath. Everyone there was amazed that THIS IS DETROIT. With a quick up hill and around we found ourselves on the gravel service trail that runs between 5 and 6 mile. Too bad illegal dumping is taking place as the short-cutting fools efforts were blocking our path. Across Five mile into Eliza Howell park we took the group across the pedestrian bridge over the river stopping for a minute to enjoy the view. Up the east side banks on through the virgin trees all were amazed that THIS IS DETROIT. It is like an undiscovered country in so much as nature can be found unadulterated, still in its original splendor. As we came up and out into a neighborhood some local kids were taken aback by the sight before them. We encouraged them to check out the trails and although they live right next to them they had never traveled in? Much to our surprise they turned and walked right in. At this point Gary was pooped so we ditched the trail and turned back east to start our trek home. Along the way the rain finally showed up as we made a break for shelter under a awning at a marathon gas station. All joined in and purchased gator aid and snacks as we enjoyed the food the vibe started to change from judgment and tensions to smiles and hellos. The kids in the SUV filling up nearby made it easy. Act like a kid and be a kid! With the Holidays behind us we once again headed north to Mackinac Island to spend a week saying Hi to Horse’s with our wonderful kids. In a world without cars there simply may be no better place to relax. No need to look for a car blowing an intersection. The only thing you have to swerve to avoid is the piles of horse poop. From great mountain bike trails, to the inner bike paths all the way out to the circle tour the place simply feels like no other we have visited. 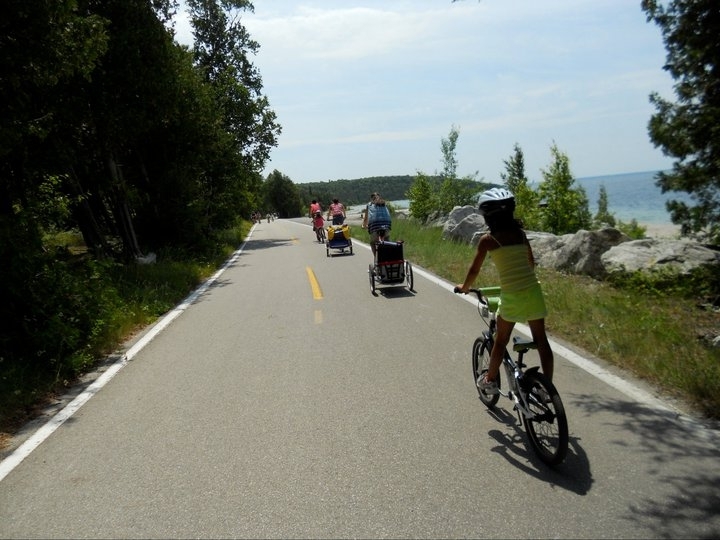 Bike Mackinac Island! J. Meyers bike explorer. Tonight’s ride was going to be a tour around our proposed ‘Inner Emerald Necklace’ route that connects 22 parks together on the street less traveled. Angie was ‘Up’ for it but others were not. Bending towards the strong influence of the group we altered our plan and decided a trip down the Detroit River was a good idea. I would like to take a moment here and step towards the direction of please read up on the type of ride prior to coming out and along. Seeing the path that was out before us I decided with some delight, to head on down to River Rouge to ‘Belanger Park’, the City’s finest Park that the good ole stubborn Dr. himself left it behind for all of us to enjoy. We slide on down and picked up the trail along the river at Riverside Park, over rail road and service trails we made our way by Fort Wayne and knocked but could not come in? From there over the Rouge at ‘Bat Man’ bridge we cut hard left and found ourselves cruising in on East Anchor Street, determined to stay on the back alley trail as much as possible. With a left and spun around right we turned left on Belanger Park Road. Slicing through Industrial Buildings ‘Fortress of Boom’, Banging, Clanging, Stamping….. We feel out of the stinky industrial tunnel and emerged through the green gates/park entry and felt better when we arrived down at the water. It is an amazing site, vistas unlike any along the Detroit River walk. While we were there we saw a Tug Boat come to the rescue of a wayward freight liner spun sideways in the current trying to ‘Back-Into’ the Canadian Port. We found our way into the Rouge Bar on East Rockwood Street. We headed out to the back deck to take in the Sun. While we were their staring back at the oil refinery the sunlight hit the structure in such a way it turned the white faced into Golden spheres and towering spires. Some saw the ‘Taj-mahal’ while others imagined ‘practical earthly parts’! It was a strong sprint back from there as Amber got hung up with a peddle issue Dan lead the others back to Cork town. We caught up with the attack near Ft Wayne as Dave looped back to see what was taking us, good man that Dave! Amber jumped 6″ off my wheel and we cut the wind all of the way back to the main group. As we stopped in Cork town it was time for Michael to say good bye. He rode down from Ferndale earlier in the afternoon and figured it was time to get going back. He gets the award for best rider this week. After brief stop @ Cici’s we mounted back up and made it back to MCB sometime after 11, I was thinking maybe I should have left with Mike? Bike Detroit! J. Meyers bike explorer. Okay, big Mike wanted this themed ride that he made suggestion for during our annual meeting on January 31st. Nobody came pimped out, although I had a Ace of Clubs card in my spokes when I left Lathrup village to ride down. Needless to say the Ace of Clubs card didn’t make the trip. As I rolled into the parking lot I was happy to see James and Amber’s car with bikes in tow. I was hoping tonight’s ride would be filled with more new people, all of which we have thoroughly enjoyed meeting. Dave’s wry smile and good sense of direction is always welcome! All told 12 people came out on the ride and none of them were shy about stepping on the peddles and I mean stepping on them hard! Michael and John joined in with the fun as Michael had once again rode down from Ferndale on his vintage classic 820 hard tail trek, recently renewed by a master bike tech. Since nobody was big NYC Pimping we decided to do an east side run out to Algonquin Park via Heidelberg and Vernor Hwy. Dropping down to Jefferson at the once famed water works garden grand limestone entry we headed a few blocks east and turned down Marquette on our way to Freud so that all of us could be psychoanalyzed about our OCD approach to bike riding. Sigmund couldn’t be found but Algonquin Park was. Sliding into the park on the Asphalt pedestrian trail we all pumped it on up to overlook hill so that we could take in the view mouth/gateway to the Detroit River. What a beautiful site, the sail boats, the cool water, Belle Isle, Bay View cocktail dresses in party along with the lovely ladies of tonight’s ride, a glimpse of Heaven! After a few minutes of deep breathing, stretching, smiling, realizing, and photo pics taking it all in we mounted back up and rolled fast down the hill, across the footbridge onto the small island attached to the park by way of asphalt trail. From there it was a kerb hop down and another kerb hop up and we set out to cross the vast field on a single track that was barely visible. I could have sworn I heard some belly aching back round but the exhaust pressure of my own deep breath drowned out the perceived complaints. Turning right cutting through the old Gar Woods Property we soon found ourselves back again on Freud as we then made our way over to Marshalls. Yup you guessed it what would a Bike Detroit ride be without dive bars and PBR’s? Marshalls sits right at the foot of the Conner Creek water shed as it finally opens up to the air once again, smiling up at the sky as it slowly return to the sea from whence it came. Hard to imagine the city engineers captured and buried this once watershed all the way from Palmer Park, sad but true and yet here it is. Needless to say the peeps at Marshalls were a little bit surprised by the colorful bike riders that had converged on their ‘Local’ place, but the lovely Bar Keep remembered us from last year and sooner than you could take your helmet off 12 PBR’s were brought up counter side. Many of the group went out the back door to take in the unique historic sight of the late 1800’s architecture, which included hand hewn wood beams for span and support of the back concrete patio. I thought to myself why not take the fences down and build a couple of steps so that Kayaks and Canoes could head up through the canals and stop in for a beer? With a good 20 minutes spent it was a quick sprint on through Grosse Pointe Park where then we made our way to Ye Old Taproom. Peanut shells flying and John with 4 pitchers of beer we laughed and mowed our way on through it all except that last assorted picture of heavy dark beer. Somehow that stuff is hard to stomach wile out on the ride. With the shadow of twilight falling down on the sidewalk, we looked out and decided it was time to get headed on back. Jen opened up and shared and it was then I decided to take the group down Charlevoix along the same route I had just experienced a few days earlier. As we mounted up Honest Jeff showed up with his good Pal and Dan and I both questioned why we did not swing on By HJ’s before heading east? Down to Jefferson back around and on up to Charlevoix and yes everyone enjoyed the relaxed beauty of the open lanes and the historic Homes. I think what they like most was the absence of any cars coupled with the sounds of the living meadows as block after block nature sung her songs. Past Grand Blvd. the call went out for an ‘Andrews’ stop, so of course we did. From there up through Eastern Market once again and onto Cass Ave. Shortly after the right turn, once again looking for my breath, Jen rolled up and said, “left at Canfield right”? With my weak yes her, Amber and James came bye like a freight train coming down hill, whoosh and before I knew it they were two blocks ahead. I looked deep within and after all of the attach sprints I led from earlier I did not think I had anything left to give. Knowing this I jumped up out of the saddle and spun as fast as I could. As the group hesitated at the light at Canfield I caught them, James was wise, and I think he saw me coming? He stepped too and was breathing hard down on my neck as I boxed out the inner line and made it back to MCB ahead of Jen and her sprinting group. As I walked stiff legged all the next day I decided next time they win! The simple fact of the matter is that it is not hard to lose your focus and balance when you choose to immerse yourself in your carrier/profession. Every year about this time I find myself looking into the mirror and asking myself when will I choose a different path and allow for balance to return. This morning, I loaded my bike and took it to work with me as I was hell bent on getting on the bike and riding home from Grosse Pointe via Downtown then north out to Lathrup Village. Whenever I am out alone riding through the city I always hit the exploration button, to get off the auto route and see yet another part of the city. Today was no different. For those of you that ride from the east side down to the city only a few choices of passage can get you there. To the south of Jefferson you have Freud, and then Jefferson or you can choose to head all the way up to Mack. For me today it was Jefferson. Bombing right with the wind at my back I imagined myself flying in the air like a kite flaps full of wind. Flowing/sweeping through construction barricades and chin music cars letting me know that they were bigger than me, my tension melted away and a smile finally made it way back to graffiti joy on my face. Just past St. Jean I made a quick right onto Beniteau then a quick left on Charlevoix. If you have never been this way please make time to do so. Another one way 3-4 lane historic stream is waiting for you to explore! This was a first time for me and well worth it. As I approached the Gratiot twist as I like to call it I turned north onto Mt Elliot and then left on Canfield for a Quick stop/hello to all of my friends at MCB. After liquid hellos I mounted up again riding through Wayne State on by the Fisher on into Palmer Park. At the corner of Pontchartrain and Merrill Plaisance I saw Mr. Eric Sabree down at the South-west corner of the Orchard that did not suit his interest. I chose to turn left this time instead of heading on through the Park as I always do. I rode on down and turned around to say Hello neighbor with all of the Compassion I could summon and muster. From there north through Ferndale, west through Oak Park and back home where the trilogy of youthful exuberance came crashing out the back door to welcome me home.